Raccoon Key in Georgia site of first Fort St. Augustine? If the French fort of La Caroline was actually on the Altamaha River in Georgia and not the St. John’s River in Florida then from where did the Spanish launch their assault on the fort? Clearly this attack could not have been launched from modern-day St. Augustine, Florida because the distances involved are too great for a two-day march as recorded by Spanish General Pedro Menendez. As I argued in my article “Original Fort St. Augustine Found in Coastal Georgia?” it is clear from the eyewitness accounts that the Spanish originally constructed an entrenchment on an island and later a more substantial fort on the mainland. 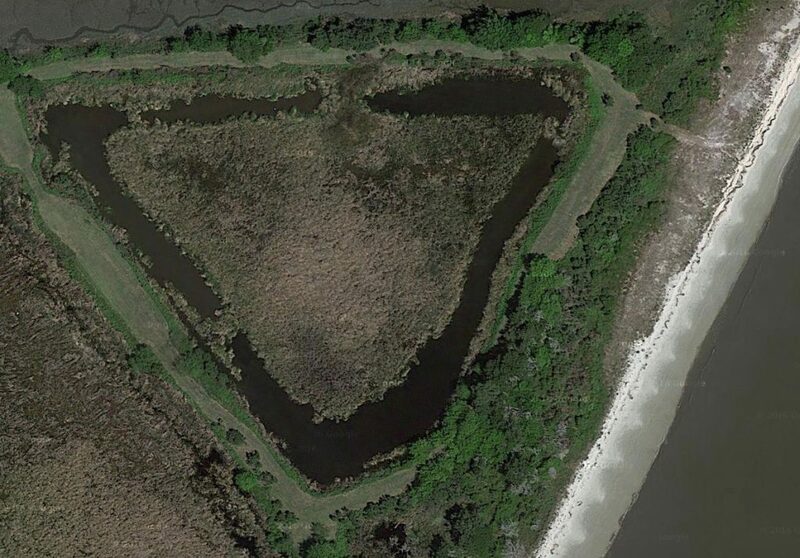 I suggested this fort was located near Indian mounds in the Lampedocia area of Camden County and the encampment/entrenchments was located on nearby Raccoon Key in St. Andrews Sound. I will now look at the evidence that supports Raccoon Key as the location for these original Spanish entrenchments. The entrenchments were on a riverbank at an Indian village named Seloy and included moats, trenches and a fortified council house. The entrenchments were 1.5 leagues (3.9 miles) from the mouth of the harbor and activities there were visible to nearby ships. The entrenchments were on an island. The entrenchments were 8 leagues south of Fort Caroline by sea and six leagues south by land and accessible to the River of May by an inland waterway. The entrenchments were sixty leagues (156 miles) north of Cape Canaveral. There were six rivers that were deep enough they had to be swum between the entrenchments and Fort Caroline. One such river was very close to the entrenchments. The entrenchments were not the same location as the fort. 1. The entrenchments were on a riverbank at an Indian village named Seloy and included moats, trenches and a fortified council house. –This shows that the Indian village was named Seloy and that the village area was used to house Spanish slaves and that “protective trenches” had been dug around the site. At Raccoon Key trenches are located around the council house site and the entire village site as well as within the village area. This also shows that the entrenchments were close enough that they could be seen by nearby French ships. 2. The entrenchments were 3.9 miles from the mouth of the harbor. –This shows that the large galleons (including the San Pelayo) could not enter the harbor so they were anchored outside. I suspect they were anchored in an area called “The Hole” off the northern tip of Cumberland Island. It’s the deepest location closest to St. Andrews Sound. –This gives the precise distance between where the ships were anchored and the ‘point of disembarkation’; i.e., the entrenchments. 1.5 leagues equals 3.9 miles. This is the exact distance between Raccoon Key and The Hole (about 3.98 miles. Zoom out on the map above to see these details.). 3. The entrenchments were on an island. –This shows that the 150 soldiers were bound for an island. I believe this is Raccoon Key. Menendez went to anchor on the St. Augustine bar which I believe is Raccoon Key Spit. 4. The entrenchments were 8 leagues south of Fort Caroline by sea and six leagues south by land and accessible to the River of May by an inland waterway. –This shows that the Spanish entrenchments were very close, no more than an hour or two sailing from Fort Caroline. –If Fort Caroline was on the Altamaha then eight Spanish leagues (20.8 miles) south of there would be the southern end of Jekyll Island which is where Raccoon Key is located. If Fort Caroline was on the St. John’s River then eight leagues south of there is modern Ponte Vedra Beach which is not an island nor does it have a harbor or riverbank. –The Indians claimed Fort Caroline was 7-8 leagues (18.2 – 20.8 miles) north via an intracoastal waterway. This is the exact straight line distance between Raccoon Key and Buttermilk Sound on the south branch of the Altamaha River via the intracoastal waterway. Buttermilk Sound is, in fact, east or “in front of” the likely location of Fort Caroline on the south bank of the south channel of the Altamaha. –The French also placed the Spanish entrenchment six French leagues (17.4 miles) south of Fort Caroline. All of these accounts are consistent with the distance of Raccoon Key from the Altamaha River. 5. The entrenchments were sixty leagues (156 miles) north of Cape Canaveral. According to Amos W. Butler in his article “Observations on some shell-mounds of the eastern coast of Florida” there were once 22 Indian mounds along the coast between Daytona Beach and Cape Canaveral. The tallest of these was Turtle Mound, a fifty feet tall shell mound. It and another named Castle Windy were the closest to Cape Canaveral. Butler noted that Turtle Mound and the somewhat smaller Green Mound “were regarded by mariners, in the day before light-houses, as the most conspicuous landmarks on the eastern coast of Florida.” (Butler, p.107) Turtle Mound is approximately 145 miles south of Raccoon Key and Castle Windy is 152 miles south of Raccoon Key. Modern St. Augustine is only 109 miles from Cape Canaveral and 71 miles from Turtle Mound thus Raccoon Key fits these distance estimates better than modern St. Augustine. –We know they were marching down the beach towards Cape Canaveral (since Spanish boats were following them just offshore) thus there would have been no major obstacles. 156 miles divided by 8 days equals 19.5 miles per day which is consistent with Menendez’s claim of 20.8 miles per day. If they started from modern day St. Augustine, 104 miles to the north of Cape Canaveral, they would have averaged only 13 miles a day in very easy terrain. Worse still, Turtle Mound is only 71 miles south of St. Augustine thus they would have averaged only 8.8 miles a day to reach this location. This seems to negate the possibility that modern St. Augustine was the site of the entrenchments. 6. There were six rivers that were deep enough they had to be swum between the entrenchments and Fort Caroline. One such river was very close to the entrenchments. –There are not six rivers between St. Augustine and the St. John’s River (see map above) thus this refutes the claim that these were the locations of the Spanish entrenchment and French fort. There are, indeed, six rivers between Raccoon Key and the Altamaha River site of Fort Caroline. –This reveals that there was a river very close to the entrenchments. This matches the Raccoon Key location (see map above) which would require the soldiers to cross a river in the marsh before reaching dry land at Dover Bluff. The Fountain of Youth site where archaeologists believe the original entrenchments were located does have a nearby river but there was no need to swim across it since their Indian guides would have surely led them down their trails which correspond to A1A & US1 which heads north towards Jacksonville with no need to cross this river. In fact there is an all land route between St. Augustine and St. John’s Bluff in Jacksonville with only one major creek, Pablo Creek, which would have needed to be crossed. 7. The entrenchments were not the same location as the fort. –This shows that the Indian village of Soloy/Seloy, the site of the entrenchments, was different than “old St. Augustine,” the site of the first fort (likely at the Lampedocia site) which was abandoned in May 1566. This also shows that a blockhouse was planned to be built on Raccoon Key after the fort there was abandoned and the Spanish had relocated to “new” St. Augustine, likely the modern-day St. Augustine, Florida. The evidence above shows that the entrenchments and the fort were two separate locations. The entrenchments were located on an island in the harbor and the fort was located upriver. I propose the entrenchments were on Raccoon Key and the fort was at the Lampedocia site. Later, after Indians burned the fort, a new fort was constructed on the island in the harbor, the site of the original entrenchments. This fort was later abandoned and the Spanish likely moved far enough away from their Indian adversaries so as not to have to be bothered with any more attacks. They moved just north of Matanzas, the location where they had previously slaughtered the French shipwreck survivors, to the location of present-day St. Augustine. The multiple French and Spanish eyewitness accounts simply contradict the claims by modern historians that St. Augustine has always been situated in its present location. 2. Menendez, Pedro. “The Letters of Pero Menendez.” Proceedings of the Massachusetts Historical Society, 1894. Vol. 8: pp. 416-468. 3. Laudonniere, Rene de. Three Voyages. University of Alabama Press, Tuscaloosa. 2001: pp. 158-159. 4. Méras, Gonzálo Solís de. Pedro Menendez de Aviles. Trans. Jeannette Thurber Connor. Florida State Historical Society, 1923. 5. Moyne, Jacques le. Narrative of Le Moyne. Trans. William Appleton. James R. Osgood & Co., Boston: 1875. 6. Butler, Amos W. “Observations on some shell-mounds of the eastern coast of Florida.” Proceedings of the XIX International Congress of Americanists. Washington: 1917: pp. 104-107. 7. Grajales, Francisco Lopez de Medoza. Trans. Lyon, 1997.